A NANKIN woman may have escaped the deadly hendra virus despite close contact with her ill foal before it died from the infection on Sunday. Her blood tests returned negative to hendra yesterday, but doctors will continue to monitor her for several weeks. Despite the result, the woman was still given an experimental treatment, monoclonal antibodies. Queensland Health chief health officer Jeannette Young said they were unsure if there were any significant side effects to the treatment as a result of limited testing on humans. Dr Young said further blood tests from the woman would be taken in three and six weeks. The woman's property, less than 5km from the site of a hendra outbreak in Nerimbera in May, will remain under quarantine for the next month. Her two dogs and two horses are being assessed for hendra. As of yesterday morning, Biosecurity Queensland officers had yet to begin searching for any signs of bat activity on the property, or from fruit that may have been dropped by a bat from a nearby colony close to the Rockhampton landfill. Biosecurity Queensland ruled out any links between the properties. A spokesman said there was no way of discovering if the bats which infected the horses from the Nerimbera and Nankin properties were both from the nearby colony. Horse owners have been urged to keep their animals safe by keeping water and food covered and keeping horses away from bat colonies. An outbreak of Hendra in Rockhampton poses no threat to the massive campdraft event running until Sunday. More than 15,000 horse-mad fans were expected to gallop into town before the end of the weekend to attend. In a press conference on Friday morning, Queensland chief vet Dr Rick Symons said there was no concern for any of the horses or people coming to town. "There is no risk for the camp drafting event at Rockhampton," Dr Symons said. "The property is under quarantine. "There is no link at all with the property and the camp drafting so there is no risk to horses coming to the camp drafting event at Rockhampton." OLDER STORY: In the past few days a Rockhampton region woman has buried her foal which died of hendra, had her home quarantined and now faces an anxious wait as she undergoes further tests for the deadly virus. The woman was flown to Princess Alexandra Hospital in Brisbane yesterday afternoon after Queensland Health officers diagnosed her as having had a high level of exposure to the animal. Queensland Health's chief health officer Dr Jeannette Young said the woman might be offered an experimental treatment called monoclonal antibodies. Queensland Health believes the drug will increase the chance of surviving hendra, but warns it has not undergone sufficiently rigorous testing in humans to ensure there were no significant adverse side effects. The male owner of the property, believed to be in Nankin, and the veterinarian who attended the foal were assessed as having a low level of exposure. The property is only 5km from the Nerimbera property which saw the death of at least two horses from a hendra outbreak less than two months ago. But Queensland chief veterinary officer Dr Rick Symons said there was no link between the properties. He said two other horses and two dogs on the property of the latest outbreak were being tested for hendra, along with other horses and dogs in the neighbourhood. It is the fifth outbreak this year and Dr Symons warned there might be more. He said the foal became ill on Friday and died on Sunday. Biosecurity Queensland tests taken on Tuesday confirmed on Wednesday night that it had died of hendra. They urged caution for up to 15,000 horse enthusiasts set to attend Paradise Lagoon's camp draft today and over the weekend. It is not a vaccine for the general population, but a treatment which maximises a person's chance of survival once they have come into contact with the hendra virus and contracted it. 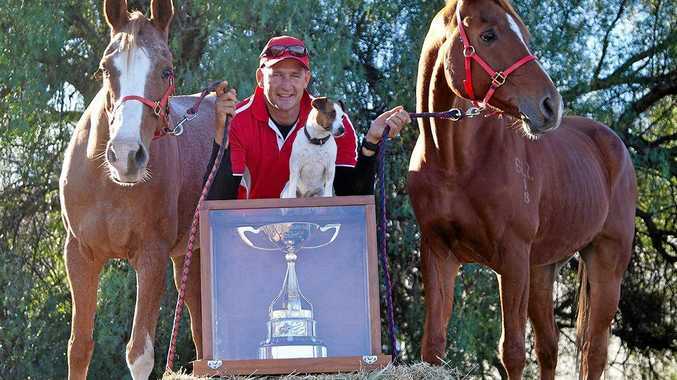 Cawarral, August 2009: Rockhampton veterinarian Dr Alister Rodgers' three horses and pony die. Nerimbera, May 2012: one horse dies. Mackay, June 2012: one horse dies. Near Rockhampton, July 2012: foal dies.